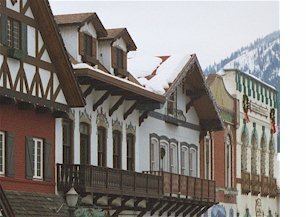 Leavenworth, having re-created itself from a forgotten byway in the eastern slopes of the Cascades Mountains into a popular Bavarian town surrounded by towering mountain peaks befitting it's architectural themes, offers a wide range of accommodations to suit the taste and pocketbook of almost any traveler. Choose from a variety of accommodations including hotels, motels, resorts, inns, lodges, bed and breakfasts, cabins, cottages and vacation rentals. For those who enjoy camping, there are both private and public campgrounds. Many of the accommodations in this Bavarian Village are pet-friendly. Find where to stay in Leavenworth by exploring this page by using the links in the left hand column or the drop down menu at the top of the page. When making a reservation, please be sure to tell them that you found them on GoNorthwest.com!